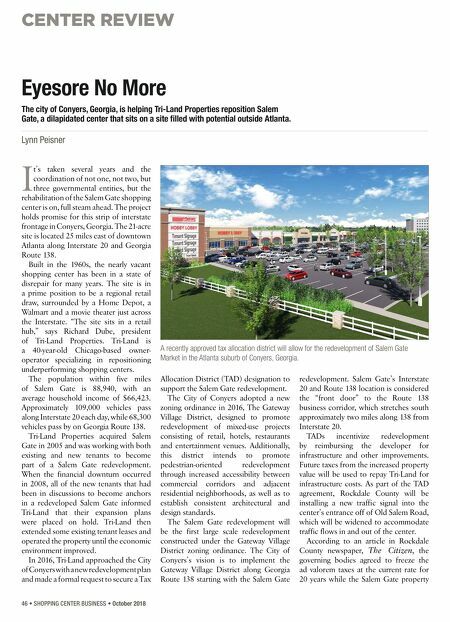 CENTER REVIEW 46 • SHOPPING CENTER BUSINESS • October 2018 I t's taken several years and the coordination of not one, not two, but three governmental entities, but the rehabilitation of the Salem Gate shopping center is on, full steam ahead. The project holds promise for this strip of interstate frontage in Conyers, Georgia. The 21-acre site is located 25 miles east of downtown Atlanta along Interstate 20 and Georgia Route 138. Built in the 1960s, the nearly vacant shopping center has been in a state of disrepair for many years. The site is in a prime position to be a regional retail draw, surrounded by a Home Depot, a Walmart and a movie theater just across the Interstate. "The site sits in a retail hub," says Richard Dube, president of Tri-Land Properties. 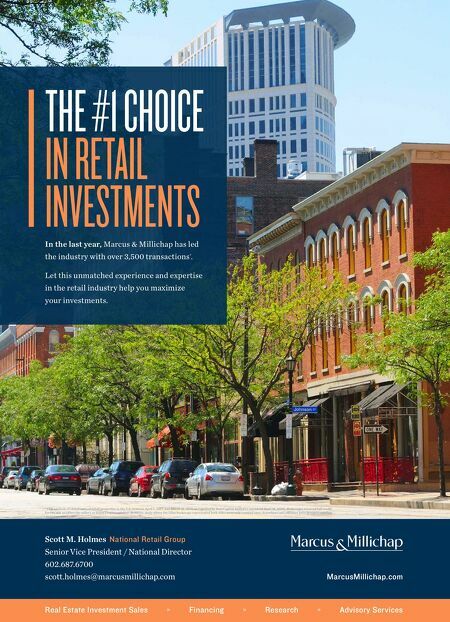 Tri-Land is a 40-year-old Chicago-based owner- operator specializing in repositioning underperforming shopping centers. The population within five miles of Salem Gate is 88,940, with an average household income of $66,423. Approximately 109,000 vehicles pass along Interstate 20 each day, while 68,300 vehicles pass by on Georgia Route 138. Tri-Land Properties acquired Salem Gate in 2005 and was working with both existing and new tenants to become part of a Salem Gate redevelopment. When the financial downturn occurred in 2008, all of the new tenants that had been in discussions to become anchors in a redeveloped Salem Gate informed Tri-Land that their expansion plans were placed on hold. Tri-Land then extended some existing tenant leases and operated the property until the economic environment improved. In 2016, Tri-Land approached the City of Conyers with a new redevelopment plan and made a formal request to secure a Tax Allocation District (TAD) designation to support the Salem Gate redevelopment. The City of Conyers adopted a new zoning ordinance in 2016, The Gateway Village District, designed to promote redevelopment of mixed-use projects consisting of retail, hotels, restaurants and entertainment venues. Additionally, this district intends to promote pedestrian-oriented redevelopment through increased accessibility between commercial corridors and adjacent residential neighborhoods, as well as to establish consistent architectural and design standards. The Salem Gate redevelopment will be the first large scale redevelopment constructed under the Gateway Village District zoning ordinance. The City of Conyers's vision is to implement the Gateway Village District along Georgia Route 138 starting with the Salem Gate redevelopment. Salem Gate's Interstate 20 and Route 138 location is considered the "front door" to the Route 138 business corridor, which stretches south approximately two miles along 138 from Interstate 20. TADs incentivize redevelopment by reimbursing the developer for infrastructure and other improvements. Future taxes from the increased property value will be used to repay Tri-Land for infrastructure costs. As part of the TAD agreement, Rockdale County will be installing a new traffic signal into the center's entrance off of Old Salem Road, which will be widened to accommodate traffic flows in and out of the center. According to an article in Rockdale County newspaper, The Citizen, the governing bodies agreed to freeze the ad valorem taxes at the current rate for 20 years while the Salem Gate property Eyesore No More The city of Conyers, Georgia, is helping Tri-Land Properties reposition Salem Gate, a dilapidated center that sits on a site filled with potential outside Atlanta. Lynn Peisner A recently approved tax allocation district will allow for the redevelopment of Salem Gate Market in the Atlanta suburb of Conyers, Georgia.